This module clocks in at 11 pages, 1 page front cover, 1 page editorial, 1 page SRD, 1 page back cover, leaving us with 7 pages of content, so let’s take a look! Now, the 5e-conversion deserves special mention here – it goes beyond the basics like converting skill DCs, poisons, damage thresholds etc. : A cursed item has, for example, been replaced with an animated rug and the formal aspects, items and loot all have been adjusted to properly work within the different power-level aesthetics of 5e. That being said, the module is significantly harder in the 5e-version. Since gelatinous cubes are stronger in 5e than in PFRPG, these can be a bit more of a challenge here. Regarding further threats, we can encounter animated, pristine armors here…and it should be noted that the faded and restored murals act as a nice way of filling in the story and the undead monarch. The PCs ultimately can find the funerary barge of Khazdoran, where the remnants of a scholar’s account can provide a hint – there is a soul prism here and, while Khazdoran actually should not be tied to it, his deeply-held conviction is that the prism, ultimately is his anchor – thus, destroying this vessel ends his haunting of the tomb forever. The pdf does note that it is “extremely fragile”, implying that any attack will destroy it, but I still wish we got some sort of mechanical representation or stats for the vessel here – still, that is not a serious gripe. It should be noted that the ghost uses default stats for ghosts in 5e, which accounts for the one page less in page-count of this version when compared to the PFRPG-iteration. That may be me, but I really would have liked the ghost to have some unique tricks up his sleeve. On the balance-plus-side, the ghost makes for a slightly easier boss in 5e than in PFRPG, which emphasizes smart play more – you can conceivably play this and really rock it…or have a tough time. It very much depends on the players. What do I mean by this? Clean and none-too-intrusive PCs may make their way to the ghost before he even realizes that they are here…but woe betide those that trigger his cleanliness compulsions… The ghost itself is a pretty potent being and has interesting tactics – like possessing PCs and running into gelatinous cubes, but as a whole, the tomb should be a challenging, but manageable sidetrek that sports quite an array of loot to find – nothing too jarring, mind you. 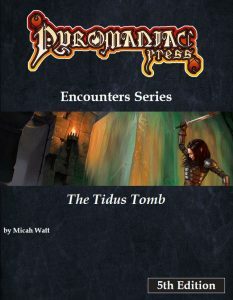 Micah Watt’s “Tidus Tomb” is a nice, creative little sidetrek that is worth checking out: The flavor-text is engrossing and the theme of the dungeon similarly is pretty…neat. (Sorry, I couldn’t resist this groaner pun…I’ll hit myself later for it…) Anyways, I did enjoy this indeed. If there is anything to complain about, then it would be that, as far as non-combat challenges are concerned, the module feels a bit *drumroll* sterile! (Sorry, I must have hit my head this morning…) Kidding aside, the flavor and dressing are amazing and lavishly-detailed, but if you expect creative hazards or traps or the like, you won’t find that here, which makes the dungeon easy to run, but at the same time, it makes the combats feel a slightly less diverse than they could be. The conversion excels at its attention. No complaints in that regard. The 5e-iteration of this module is definitely harder than the PFRPG-version and whether you like that or don’t depends ultimately on personal preferences. With the potent and rather tough cubes (84 hit points…), the module certainly feels less suited for a lighthearted interpretation than the PFRPG-version. So, how to rate this? Well, as a whole, I enjoyed this and while I consider the dungeon’s mechanics per se to be slightly less than what they could have been, this is well worth checking out. The well-done conversion makes the module run in a slightly different manner, which is actually something I personally enjoyed, gaming aesthetics-wise. For the extremely fair price of just 2 bucks, this makes for a fun and creative, well-presented sidetrek. The 5e version has a slightly different focus, resulting from the respective changes in focus, creature potency etc., but ultimately evens out – it is a bit more focused on smart player decisions, at least in my book. Ultimately, I like both versions and as such, my final verdict will clock in at the same verdict, 4.5 stars, rounded up for the purpose of this platform. You can get this neat (haha!) sidetrek here on OBS!